In 1844 "La Dominicana" won its independence from Haiti. The Dominican Republic's constitution of the same year regulated relations between church and state, in line with the national motto: "Dios, Patria, Libertad" ("God, Fatherland, Liberty"). However, by 1907 "the various Dominican constitutions [by then 14 in number] had evolved from establishing the Catholic religion as the state religion to including religious tolerance". This constitutional development was made possible by the country's lack of a concordat. Without the constraint of a treaty with the Vatican, church-state relations were frequently adjusted by the Dominican parliament and moved towards secular values, including tolerance of other religions. The concordat was meant to end this evolution by freezing church-state relations in a form that met with Vatican approval. This painting, brought from Spain in the early 16th century, is said to work miracles. 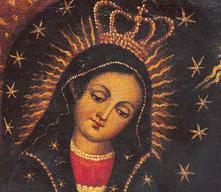 It depicts La Altagracia (Our Lady of the Highest Grace) the patron saint of the Dominican Republic. (Altagracia, Tatá for short, is also a favourite Dominican name.) On her feast day on January 21 Dominicans flock to her basilica in Higüey to pray for her help. Dominicans may also appeal to curers (curanderos) and witches (brujos), traditions brought from Africa at the time of the slave trade. Curanderos may ask the saints for advice about herbs, roots and other home cures, while witches may also rely on the saints to help them drive out the spirits that possess the patient. Like the Catholic saints, these traditional healers lay claim to gracia — Spanish for “divine grace“. Dominican Catholicism mixes Spanish and African traditions, allowing La Altagracia to be regarded in many different ways. Actually, the Dominican Government had long wanted a concordat, in the mistaken assumption that this would confirm the new nation's control over its largest social institution. As former subjects of the King of Spain, they expected to inherit the powers which he had exercised over the national church. This privilege of "His Most Catholic Majesty" — which was extended to his colonial administration — was called the right of royal patronage (patronato real). It had been assumed as a matter of course by the newly independent countries of Latin America under the suitably republican name of "national patronage" (patronato nacional). However, the Vatican had no intention of granting to a small Caribbean republic the same concessions that it had conceded to the powerful King of Spain. The concordats of the various Latin American republics were meant to end, once and for all, the Spanish tradition of these states regulating their own national churches. I do not pledge allegiance to wicked laws.... There are two powers here, the civil and the Church. The Concordat with Trujillo, "Benefactor of the Church"
It wasn't until well into the 20th century that the time was ripe for a favourable concordat. As Hitler, Franco, Salazar, Duvalier and many others found, when a dictator needs Church support, the price for this is often a concordat. So it was with Generalissimo Rafel Trujillo, the de facto ruler of the Dominican Republic from 1930 until his assassination in 1961. 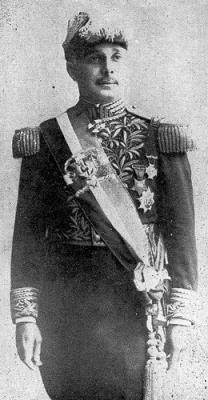 Nicknamed "Bottlecaps" (Chapitas) for his fondness for medals, he also liked embroidered uniforms, epaulettes and hats with ostrich plumes. However, life under Trujillo was no comic opera. By the 1950s Trujillo had a number of reasons to want recognition by the Vatican. ♦ The Generalissimo had become an international pariah, as the world learned of "The Cutting" ("El Corte"), the 1937 slaughter with machetes of thousands of Haitians living in the Dominican Republic  and of the torture and/or murder of everyone who opposed him. 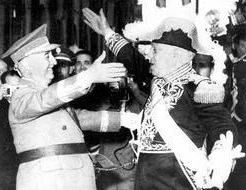 His assassination attempt on the President of Venezuela didn't come until 1960, but even by 1954 Trujillo was so scorned internationally that Vatican recognition in the form of a concordat was a welcome prospect. ♦ This diplomatic alliance with the Vatican would also help Trujillo consolidate his anti-Communist credentials. On 6 March 1953 the Dominican Republic became the first Latin American state to sign a mutual defence pact with the US — several months before Fidel Castro's first abortive attempt to launch a revolution in Cuba that June. Trujillo, the "medal-jingling" dictator on the island next to Cuba, savoured his new importance as Defender of the Free World against Godless Communism. ♦ And naturally, the support of the Church would help Trujillo domestically, as well. If the Catholicism of some of his countrymen was not entirely orthodox, it was nonetheless enthusiastic. In fact the emphasis of Dominican religion on health cures let Trujillo insert himself into the colourful local pantheon of saints, folk healers (curanderos) and witches (brujos). "Only Trujillo cures you," said the inscription on a hospital. Public fountains proclaimed "Trujillo gives water". Hundreds of towns, streets, buildings were renamed after Trujillo, his father, his mother, and his patron saint, Rafael. His political slogan was "God and Trujillo". Dominican schoolchildren recited daily prayers for "God, country, and Trujillo". And a Church bull of 1935 talks of "the political-Catholic genius of the distinguished magistrate Generalissimo and Doctor Don Rafael Leonidas Trujillo Molina, whom his compatriots [...] have honoured with the golden laurels of Benefactor of the Church and Father of the New Fatherland." Generalissimo Franco had signed a concordat in 1953 and the next year Generalissimo Trujillo followed suit. Through the 1954 concordat the Church obtained control over marriage and religious instruction and frustrated Trujillo's attempts to claim for himself the presentation of bishops, (patronato real), the privilege of Spanish kings. With the signing of the concordat great benefits were granted to the Catholic Church [for example, access to public funds and exemption from import duties]. It allowed the creation of dioceses, and bishoprics were established in Santiago and the Vega. Until then there had been only one hierarchy in the country which was the Archbishopric of Santo Domingo. Religious instruction was also established in public schools. Religious marriage was made official and divorce was prohibited between those who had been married by the Church. Other religions were at a disadvantage compared with the Catholic and one of them, Jehovah’s Witnesses, was banned by a 1957 law, due in reality to the members’ refusal to enlist for mandatory military service." 2. Herrera, ibid., p. 4. 3. Herrera, ibid., p. 6. 4. The arrangement secured the year before by Franco in his concordat. 12. Salesian Bull, 11 October 1935, cited in Carlos Nouel, Historia eclesiástica de la Arquidiócesis de Santo Domingo, (Rome 1913 and Santo Domingo 1914), III, 388. 13. Herrera, ibid., p. 7. 14. Herrera, ibid., p. 8. 16. “El cardenal dominicano critica a los protestantes por rechazar el concordato” (“The Cardinal criticises Protestants for rejecting the concordat”), Soitu.es, 24 October 2008.